Entries need to be in by 28th February. Tullis A came 2nd (633 points), Tullis B came 5th (602) , 272 a came 8th (590), 272 b and Tullis came 15th 556 and Tullis and Brighton Team came 19th. Fantastic results against very tough competition, well done everyone!! Hartfield Scouts won the Scout section (617 points) with Percy Pigs (Crowborough Southon) 2nd (592), Buxted 6th (546), Uckfield Alpha 8th (541), Buxted 9th (537) and Crowborough Southon 2B 10th (534). All the Ashdown Scouts and Explorers finished and were awarded their certificate and Overland slider (woggle). I thought last year was a bit of a flash in the pan. If you remember we sent all the teams out, brought them all back in and dominated the top 10 in the Scouts competition with a great showing in the Explorer competition. I had no expectations that this could be repeated, possibly ever. Fast forward 12 months and we send out 11 Ashdown teams and they all walked in! Totally amazing. You can imagine my pride when the first Ashdown announced in the Scout rankings was in 10th place with Southon 2B! We then went on to secure; 9th Buxted (Not quite sure which as it was slightly confused), 8th Alpha/ Southon combined, 6th Buxted, 5th Phoenix, 2nd Southon Percy Pigs and 1st place with Hartfield. That means Ashdown secured 7 of the top 10 places including first and second! Explorers fared almost as well with 272 B in 15th, 272 A in 8th, Tullis B in 5th and Tullis A in 2nd. It should also be added that the Tullis A team also beat the Saturday and Sunday walk times with Saturday being completed, including incidents, in just 6 of the 9 hours given. They then left the campsite Sunday and beat one checkpoint's staff to their checkpoint arriving 30 minutes early and were at the finish 40 minutes ahead of schedule (They were still setting up too!)! They were flying. We did it!!!!!!! We have pulled in a performance of equal quality to last year! Who said it couldn't be done? Umm, well I wasn't convinced and will happily eat my words. I look forward to reading the final scores for the analysis but one thing that cannot be doubted is the excellent young people we have in this wonderful district. They performed, not just for themselves but for their teams and team mates but also for all of you. You should be very proud of your teams, they have truly done well. I know I am! Buxted - both teams, neither of which have ever hiked before, nailed it. Special mention has to go to the little ninjas who turned to another leader about 6 weeks ago and said they were not doing too badly as they were only the B team and really were not expected to do as well as the A team. I say to them bull sh*t! They can and should be proud to call themselves 'Overlanders' and are every bit as good as any other team! Alpha/ Southon - A combined team who had walked together errr, never! An amazing performance and once again showing how great the friendship bonds are across the district. Phoenix - under new management this year in the guise of David, showed him why he gave up his time every weekend for 3 months. They built on their performance of last year and never stopped smiling. Southon 2B - The rising stars of Southon and with so much potential for the future. With their hearts on their sleeves, they left nothing on the hill. This is a team to inspire the young and old alike. They demonstrated time and time again that you can achieve great things with courage and determination. Southon Percy Pigs - Beaten in to second but gracious, kind and supportive to those on the stage. A wonderful performance by them even achieve second but showed the qualities of true Scouts when congratulating the winners. Hartfield - the small, village group from a small village on the Kent/Sussex boarder who won the competition. A truly inspirational performance. Village groups, stop and listen! Hartfield have a huge message for you. Lewis - A Tullis Explorer who wanted to hike. He found 3 others from Brighton to make up a team. 2 of them had never hiked the Overland before, like Lewis. One had never hiked before! Simply finishing was a huge achievement but coming 19th was amazing. I would also like to say a thank you to Summer who joined with three of 272 to complete a team - Summer, please think of yourself as an official honorary member of 272. Then we have the explorers. Our (Slightly mad) stalwarts. I am always amazed how good these people are. No one quite believes how many turn up for the first session of the season on the Ashdown Forest for the map and compass training session, like they need it! The bits we leaders don't get to see are that these young men and women help prop up the less experienced Scout teams, guide them if they seem to be drifting off course, encourage them and push them along if time is tight. I only got to know this through insider knowledge. I am not sure how many, including the overland organisers, know just how much they do, as well as hiking their own competition. They are quite some role models. Impressively I see many of our current scouts starting to follow their example. To the teams of Tullis and 272, I salute you! Last and by no means least, you the leaders. Not only have you developed these great young people who have taken your teaching and applied it so successfully but you turned out and manned checkpoints for the hike. I would like to specifically thank the people who turned out even though they didn't have any specific reason to drive to the western edge of West Sussex; Steve Brooks, Mark Wakelin and Robin Carmichael (Even though Grant nabbed him for his checkpoint!) for the rest of you, thank you. At our peak on checkpoint 4 we were running 10 concurrent incidents with 18 teams checked in. I am not convinced many other districts could do this and so smoothly while also running a second checkpoint a few kilometres away! I will be sorting out the date and putting together the information for the Ashdown post Overland walking expedition shortly. We are looking at going up to Yorkshire and of cause everyone who completed the training has already qualified to attend (Along with any leaders who would like to join us - please?!). Finally, I would like to thank you all for flying with Ashdown! I think I might have this sentence is the wrong way round. I think it should read Ashdown are flying, thank you! Well done to Lewis for helping make up a team from Hove, many of whom had not walked the Overland before so a 19th place finish is very credible indeed. Also well done to Summer who joined forces with 3 272 Explorers to finish 15th. Tullis B (Amelia, Jack, Chris and Tyler) came 5th whilst Tullis A (Sammy, Emily, Will and Archer) narrowly missed top spot but coming a very worthy 2nd!! Can we also say a big thank you to Charles Jennings who had just turned 18 so missed out on being able to compete but turned up to help on the Checkpoint, supporting his fellow explorers. Also to Ava helped out all weekend on the checkpoint and wanted to be there for her fellow explorers to encourage them and congratulate them on there magnificent performance. The images of Southon Troop participating in these incidents have been removed at the request of the Scout Leader in order to avoid the risk of parents complaining. What the best dressed Tullis Explorers are wearing this year! 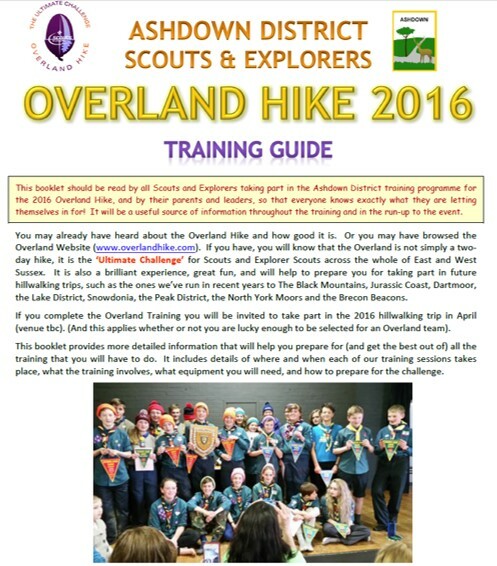 Click here for the Ashdown District Practice Hike 2016 Results. Some interesting statistics. Tullis A will learn that if you don’t look after your eggs carefully, the points loss can make a huge difference!